As the nights draw in and the roads get icier, it’s time to consider the impact of the coming winter on your fleet of vehicles. Inevitably, in these darker winter months there’s an increased risk of accidents. In 2015, according to Department for Transport (DfT) figures, 29 people were killed, 251 were seriously injured and 2,274 were slightly injured in reported road accidents on British roads where there was snow or ice. Repeated freezing and thawing also leads to the creation of more potholes which can damage vehicles. Winter can take its toll on any vehicle, but none more so than those in frequent use. The risks to your drivers and customers only increase with the number of roads driven and the amount of hours clocked in service during the winter months. Preparation is really key to operational resilience during the winter season. With the right checks and maintenance in place now, you’ll be able to minimise the effects of vehicle failure, whatever the weather may have in store. And, by ensuring your drivers are kept regularly up to date and well trained for potentially hazardous road conditions will mean your workforce is motivated and empowered to put safety first. Try to time your fleet servicing for November, before the brunt of the cold weather strikes, so you’ll know that your fleet has been checked really recently. There are also some checks drivers can make to cars before clocking on. They should check that lights are clean and fully working to ensure maximum visibility both of and to other traffic and pedestrians given the increased likelihood of driving in poor visibility weather conditions and darkness. They should also quickly check that the windscreen wipers are working, that the washer bottle is filled up with screen wash, and that all fluids (including anti-freeze and oil) are topped up to prevent freezing. Tyre condition, tread depth and pressure should also be inspected to avoid accidents caused by poor tyre grip on icy or wet roads, as, according to car manufacturer Kia, 48% of winter accidents are caused by skidding. Batteries and spark plugs are common cold weather culprits. For vehicles over three years old, consider replacing batteries and changing its spark plugs to help it last through the coming season. However, don’t ignore younger vehicles – keep them corrosion-free and in tip top condition by using a post and terminal cleaner. Beyond the age-old problem of being stranded in the cold and dark by forgetting to fill up with fuel ahead of a winter journey, there’s a second benefit to keeping the fuel gauge well above the red line. If water vapour collects in the bottom of a tank it can be drawn into the fuel line and, should the mercury plunge, it’ll freeze – which prevents the engine from starting. Drivers should never let fuel levels drop below halfway. Consider adding this to your list of regular checks over the colder months. Another key culprit of calls to vehicle rescue organisations is cold soaks – where the engine fluids and the steel of the engine block drop to low ambient temperatures. This happens when a car sits unused for more than a day and it impacts starting and charging systems – which could cripple your fleet. Make sure you’re regularly turning over the engines of any vehicles left unused. It’s all too easy to leave minor repairs until the problem either becomes worse or you have the operational flexibility to take the vehicle out of service to sort it out. However, the winter will cruelly exacerbate a whole host of common issues, which could lead to accidents and incidents that could well be avoided. For example, inspecting and replacing frayed belts and worn brake pads constitute essential repairs when you know winter is just around the corner. Drivers are crucial to safety. Surely it follows that well-trained, informed and empowered staff that are able to take ownership in potentially hazardous situations can only serve your business and its customers well. Regularly relay traffic information to drivers and encourage them to keep up to date with localised weather conditions and road closures. Things can change quickly and a single journey can face multiple weather conditions and environmental hazards. 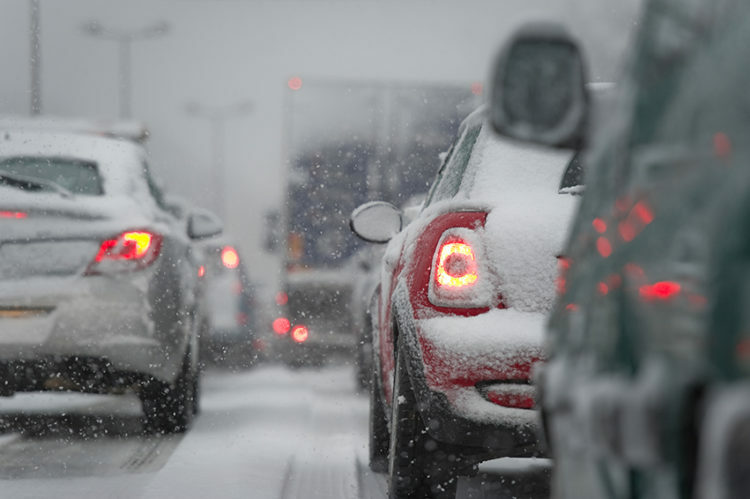 Having a poor weather driving policy in place – where drivers know when to stand down or change their journeys in the name of safety in unpredictable weather – can be enormously useful. Build safety and weather briefings into any team meetings and communications while the driver is behind the wheel. Talk about stopping for rest after demanding driving conditions – they can take their toll on concentration. And then there’s the practical arrangements for what to do in the event of breakdowns or getting stuck. Figures from the RAC in 2015 show the impact of winter on vehicles the length and breadth of the UK: RAC received a call for assistance ever 1.2 seconds during the worst weather of the year, attending over 750,000 breakdowns in total. This has led them to estimate that motorists are 50% more likely to breakdown at home in winter. It’s clear to see the impact of poor weather and shorter days on driving conditions, let alone the commercial impact for your business on cars and drivers out of service. At worst, there’s the increased risk of serious accidents that comes from perilous weather. However, by implementing the tips above and taking a proactive and forthright approach to preparing for winter, your business, your drivers and your customers can look forward to a profitable and safe driving season.